Denisof was born in Salisbury, Maryland, the son of Dr. Christiana Taylor and Gerald Denisof. He is of Russian, French, and Irish ancestry. He moved to Seattle, Washington, when he was three years old. He attended Highline College, where his mother was head of the drama department. After graduating from St. Paul's School in Concord, New Hampshire, he moved to London, England, at age 17, where he lived and worked for several years. Whilst there, he studied at the London Academy of Music and Dramatic Art. Beginning his career in the film industry, Denisof was the fight director for a stage production of Hamlet, and in 1991 was the fight director for the BBC's The Other Side, Romeo and Juliet, and The Soul's Dark Night. Alexis's first lead was alongside Christopher Lee in the feature film Murder Story where he played an investigative reporter. It was released in 1989. One of his first known works in television was on the arcade version of the video for "Got My Mind Set On You" by George Harrison. In 1995 he landed a small part in the 1995 movie First Knight, appearing as one of Arthur's round table knights in multiple scenes with Sean Connery and Richard Gere. Following those roles, Denisof worked with Sean Bean in three episodes of Sharpe as Lord John Rossendale in 1997. His best-known character, Wesley Wyndam-Pryce, was first introduced in 1999 to season 3 of Buffy the Vampire Slayer as Buffy's replacement Watcher. Originally, Wyndam-Pryce was supposed to be killed off in the season 3 finale but, due to Whedon's surprise at how well he fit into the series, Denisof was given the choice about his character's fate and chose for him to live. As a result, he later showed up in season one, episode 10 of Angel, and was an official main cast member from episode 11 (effectively replacing Doyle), appearing in 100 out of the 110 episodes of the series. The character was heavily endeared to fans due to the transformation from goofy and lovable, to dark, depressed and moody as a result of events that occur over the course of the series. The end of the series in 2004 saw a bit of a lag in Denisof's career. Save for appearing in three episodes of the hit series How I Met Your Mother, as the goofy philandering Sandy Rivers, Denisof would not work as much as he used to for the next several years. During this time he appeared in several stage productions, including Rope at Chichester Festival Theatre's Minerva Theatre with Anthony Head, who played Wesley's predecessor Rupert Giles on Buffy. Most likely due to his time playing an English character on Angel, Denisof was among 200 actors considered for the role of James Bond in Casino Royale, but lost out to Daniel Craig. Later, in 2008, he appeared in Season 2 of Private Practice as a man named Daniel, who has two pregnant wives giving birth on the same day. In 2009, he appeared in four episodes of Joss Whedon's Dollhouse as Senator Daniel Perrin. In 2011, Denisof reprised his recurring role in How I Met Your Mother, as Sandy Rivers; he appeared in 10 episodes, his last appearance was in ep. "Gary Blauman". In a season 1 commentary, creators Craig Thomas and Carter Bays speculated that Denisof was initially reluctant to take the role back in 2006 because he feared it was just charity work on account of his wife, Hannigan, playing a main character on the show. They went on to state that he was not aware, until they actually told him, that they were huge fans of his work dating back to his time on Angel. Since 2011, Denisof has been relatively active. He played a voice role in the animated DC movie Justice League: Doom. He was featured in the majority of episodes in the AOL webseries, Little Women, Big Cars. Denisof was then cast as a lead in Bryan Singer's new webseries H+: The Digital Series. He then reunited with Joss Whedon for two different film projects. The first was a minor role in the summer blockbuster The Avengers, as The Other, a servant of the character Thanos, and a cohort of Loki. The second was the lead male role in a modern version of Shakespeare's Much Ado About Nothing, which premiered at the Toronto Film Festival, to positive reviews from critics. The film was released worldwide in June 2013. In August 2013 he was cast in the third season of NBC's Grimm as a recurring character named Viktor Albert Wilhelm George Beckendorf. In 2014, Denisof reprised his role as the Other in Guardians of the Galaxy. In the same year he began starring in the MTV television series Finding Carter as David Wilson. 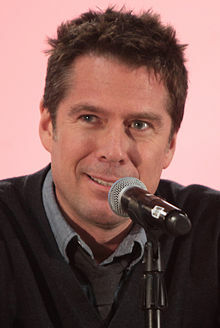 As of 2018, Denisof stars in I Love Bekka and Lucy as Glenn, and was nominated for a Primetime Emmy Award for Outstanding Actor in a Short Form Comedy or Drama Series, his first such nomination. On November 28, 2018, it was announced by Deadline that Denisof would star in a recurring role as Adam Masters in the second season of Netflix's Chilling Adventures of Sabrina series. According to the DVD release of Angel's Season Five, three weeks before the filming of the season premiere Denisof was stricken with Bell's palsy, from which he later recovered. Due to the paralysis of the left side of his face, scenes were structured as to not show its effects. Denisof married past co-star Alyson Hannigan, who played Willow Rosenberg in Buffy the Vampire Slayer, on October 11, 2003. The couple live in Encino, Los Angeles. They have two daughters, born in March 2009 and May 2012. Soldier Soldier Lt. Bob Steadman Episode: "Proud Man"
1997 Crime Traveller Episode "Fashion Shoot"
Highlander: The Series Steve Banner Episode: "Diplomatic Immunity"
2000 Randall and Hopkirk Richard Shelley Episode: "Paranoia"
"The Curse of the Kobra (1)"
"The Curse of the Kobra (2)"
The Legend of Tarzan Henry (voice) Episode: "New Wave"
2006 Justice League Unlimited Sam Scudder / Mirror Master I (voice) Episode: "Flash and Substance"
2008 Private Practice Daniel Episode: "Serving Two Masters"
2015 Robot Chicken Mr. Peanut, Ryder, Knife Shark Narrator (voice) Episode: "Cheese Puff Mountain"
^ a b "Alexis Denisof". Metacritic. Retrieved 13 August 2015. ^ a b "Alexis Denisof Biography (1966-)". Film Reference.com. Retrieved 27 October 2014. ^ "Alexis Denisof". TV Guide. Retrieved 27 October 2014. ^ "Alexis Denisof". SuperiorPics.com. Retrieved 24 April 2012. ^ P., Ken (11 February 2003). "Interview with Alexis Denisof". IGN.com. Retrieved 16 March 2013. ^ "Alexis Denisof: Performing Credits". Bentley's Bedlam. 8 March 2001. Retrieved 24 April 2012. ^ a b Mitovich, Matt (27 October 2008). "Exclusive: Angel Alum Brings Double Trouble to ABC's Practice". TV Guide. Retrieved 24 February 2015. ^ Bierly, Mandi (5 August 2009). "Alexis Denisof starts shooting 'Dollhouse': Please play a suit-wearing badass". Entertainment Weekly. Retrieved 24 February 2015. ^ Gelman, Vlada (16 December 2010). "How I Met Your Mother: 'Buffy's' Danny Strong, Alexis Denisof to guest". Los Angeles Times. Retrieved 24 February 2015. ^ O'Connell, Michael (17 March 2014). "'How I Met Your Mother' Reunites Cast Spouses as End Draws Near". The Hollywood Reporter. Retrieved 24 February 2015. ^ Hasan, Zaki (8 August 2013). "Interview: Alexis Denisof & Amy Acker on Much Ado About Nothing". The Huffington Post. Retrieved 24 February 2015. ^ Ng, Philiana (12 December 2013). "'Grimm': Alexis Denisof Makes His Royal Debut". The Hollywood Reporter. Retrieved 24 February 2015. ^ "Video: MTV Debuts the Trailer for Its Highly Anticipated New Drama Series, 'Finding Carter'". The Futon Critic. 11 June 2014. Retrieved 12 June 2014. Finding Carter" stars Kathryn Prescott as "Carter Stevens" ("Skins"), Cynthia Watros as "Elizabeth Wilson" ("Lost"), Anna Jacoby-Heron as "Taylor Wilson," Alexis Denisof as "David Wilson" ("Buffy the Vampire Slayer"/ "Angel") and Zac Pullam as "Grant." The series also features Milena Govich as "Lori," Meredith Baxter as "Grandma Joan" ("Family Ties"), Robert Pine as "Grandpa Buddy" ("CHiPs"), Eddie Matos as "Kyle," Alex Saxon ("The Fosters") as "Max," Jesse Henderson as "Gabe" and Stephen Guarino as "Toby. ^ Eckmann, Sam (24 July 2018). "Alexis Denisof ('I Love Bekka and Lucy') could become the first 'Buffy' alum to win an acting Emmy". Gold Derby. Retrieved 4 August 2018. ^ Leitereg, Neal J. (31 December 2016). "'Vampire Slayer' star Alyson Hannigan settles on contemporary lair in Encino". Los Angeles Times. Retrieved 1 January 2017. ^ Wihlborg, Ulrica (31 March 2009). "Alyson Hannigan Welcomes a Daughter!". People. Retrieved 4 August 2018. ^ Ravitz, Justin (12 June 2012). "Alyson Hannigan Welcomes Daughter Keeva Jane!". Us. Archived from the original on 15 June 2012. Retrieved 27 October 2014. Wikimedia Commons has media related to Alexis Denisof.